In Part 1 of 'Things to do around Darwin' we take a look behind the scenes of what makes Darwin and surrounds unlike anywhere else. This is a tourist guide for those looking to take home a piece of the NT, the insiders look into our food, art and exports that are unique to the Top End.Think leather, think molluscs, think markets. The Top End is home to the largest density of Saltwater Crocodiles (Crocodylus porosus) in the world, there are estimated to be well over 100,000 in the wild. These prehistoric creatures are one of the biggest draw cards to the region with several crocodile farms and wildlife cruises operating throughout the year. Although not the typical picture of beauty in most peoples eyes - the iconic Saltwater Crocodile skins are recognised as the most valuable of all the reptile skins in the world and it's here in Darwin where the industry booms. The Darwin Crocodile Farm alone has more than 70,000 crocodiles! They exports the skins to luxury companies around the world, such as Louis Vuitton and Hermes. di Croco in the Darwin Mall sells the highest quality croc items and can arrange in-house tours upon special request detailing the tanning process, specifications, colours and finishes. 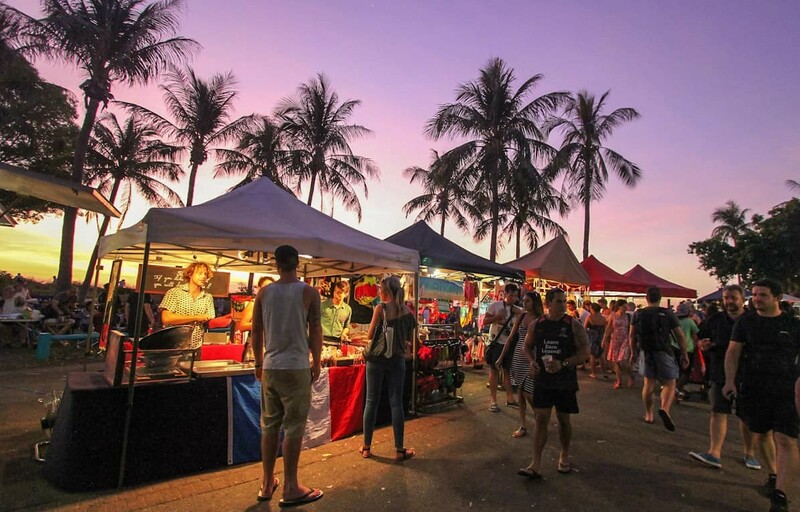 For more affordable crocodile leather, you can head down to the Mindil Beach Sunset Markets (Thursdays and Sundays during the dry season) or Parap Market (Saturdays) and talk to the local stall holders. As the weather heats up in Darwin and the 'build up' starts forming, the Top End braces for a period known locally as mango madness! Although a term referring to locals 'going troppo' from the intense humidity, it is also the time of year when the mangoes are being picked for the shelves. If you travel in any direction out of town you are certain to see lush fields of mangoes lining the highways. These sweet tropical fruits are one of the regions most successful agricultural enterprises and can often be found selling cheap on the sides of the road! The best time to find them are Oct-Dec.
For those with a vehicle, roughly 60km out of Darwin, Crazy Acres Mango Farm & Cafe is situated on a family run, 25 acre mango farm in Berry Springs and offers everything mango- from mango smoothies to mango cheesecake and ice cream, a great experience to check out. Besides mangoes, there's one other food that defines the NT like no other, and you'll find it in just about every Top End pub, cafe, restaurant and waterway. Barramundi. Take a stroll down a suburban streets of Darwin and you'll certainly get a feeling as to what the locals get up to in their spare time, with just about every second driveway housing some kind of fishing vessel. Basically, if you live in the NT Barra fishing is just a way of life, and getting out on the water to catch your own dinner can't be beaten. If you've got the time, its well worth getting out and trying your luck with one of the local fishing operators, you don't have to be into fishing to enjoy your day, the wildlife and landscapes you will encounter along the way speaks for itself! Once back in the big smoke, head down to one of the many waterfront restaurants for some fish and chips and see what you think. Tip- make sure you are ordering 'wild caught NT Barramundi' as there are farmed imitations out there. If you're grabbing a bite to eat at the wharf its likely you will see a big white vessel with the name Paspaley written on the side. Owned by the Paspalis family, this is part of a fleet of vessels making up one of the worlds leading pearling companies. Back in the early 1900's Darwin was the worlds most important pearling port alongside Broome in Western Australia. Today Paspaley operates 20 pearl farms dotted along the coastline of North-Western Australia creating superior pearls sold in nine retail stores globally. In the CBD, on the corner of the Smith St Mall you will find an impressive twenty storey building belonging to the family owned business, with the ground flour housing a huge display of pearls for sale. So there is a sample of what the Top End has to offer. In the next part of 'things to do around Darwin' we will explore some of the markets that make the NT unique!